Hic Dragones – Monsters: Subject, Object, Abject. 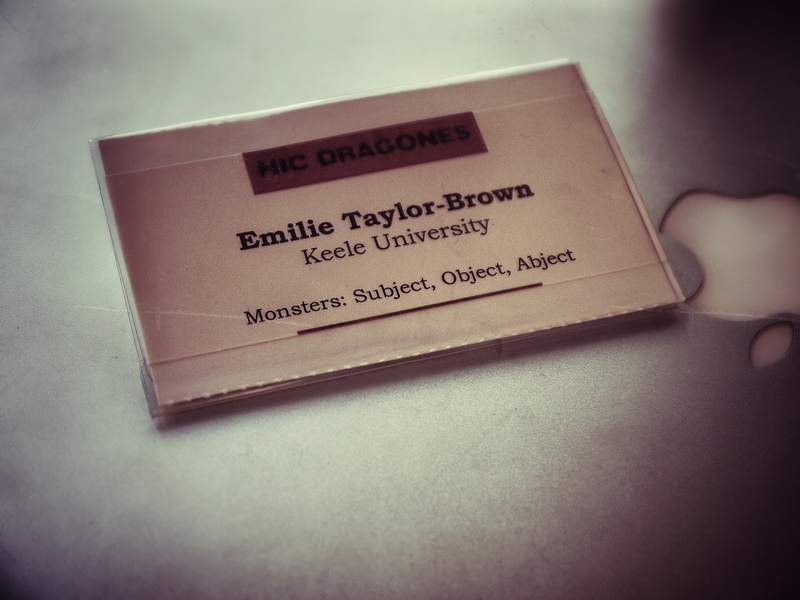 Last week (12th-13th April 2012) I travelled to Manchester Museum for the much anticipated Hic Dragones conference on the new in vogue topic of ‘the monstrous’. Conferences seem to be popping up all over to address the idea of the monster and the monstrous in 2012 so I was expecting rather a lot from the ram-packed 2 day schedule. And boy did it deliver! From monstrous houses to monstrous narrative, Japanese Kappa myth to the quantum immortal, there were a diverse range of enthralling and exciting papers. Talks from literary scholars, artists, performers, and a museum curator branded the conference appropriately interdisciplinary. Matthew Freeman of the University of Nottingham presented a paper on the figure of the child in Doctor Who, sparking an interesting debate about the evolution of children’s television from the innocuous PG-rated Goosebumps of the 90’s to the sometimes quite terrifying Sci-Fi of Dr. Who. Notably Goosebumps was marketed as ‘horror fiction’ whereas Dr. Who is ‘science fiction’ – does this indicate the infiltration of horror to other genres? Matthew’s paper discussed the figure of the child in conjunction with that of the monster, arguing very competently for a narrative and conceptual connection between the two. James Campbell’s paper on the portrayal of mental illness in DC Comics’ Batman franchise, Tracy Fahey’s paper on the diabetic body, and Michel Delville and Andrew Norris’ joint-paper on hunger and resistance all discussed the (mis)representations of stigmatised illness in popular culture. Papers on the self-constructed monstrous facade (Lisa Temple-Cox’ Making myself a monster, Rosie Garland’s The girl you never loved but always looked for, and Susanne Hamscha’s Gaga, Oh La La: Lady Gaga and the pleasures of being a freak) sparked hot debate concerning society’s willingness to accept the monstrous aesthetic – artificial versus natural, and drew our attention to the parameters of monstrosity. This primed us to receive papers dealing with less conventional subjects like Ersi Ioannidou’s Dismembered Domestricity: the House as Monster, David Allen’s Expedition Everest and Garfield Benjamin’s Virtual Monsters: Becoming Death and the Quantum Immortal. A whirlwind of talks on monstrous: choices, spectatorship, politics, tradition and even cuteness over the two days kindled controversy, dispute and constructive dialogue – punctuated by two beautifully prepared lunches and, of course, plenty of tea and coffee! This well-structured and intellectually intriguing conference brought together kindred spirits for refreshingly interdisciplinary discussion – choosing between parallel sessions was truly crippling!